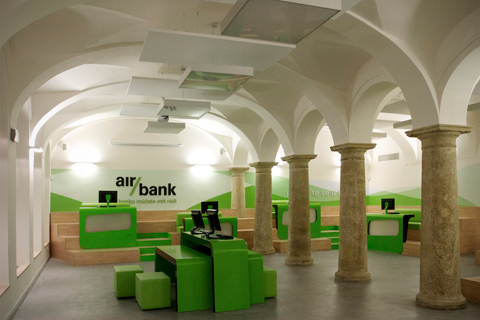 Crea International designed a new kind of bank store which aims to be noticed and admired, the Air Bank. A new innovative concept, not a transactions one more transparent than the others, honest to the customers and itself, capable to drive people in self evident and intuitive lanscape with its fast orientation within the store. The customer as protagonist of a new bank trip where he must feel that’s the unique bank he wants, where receiving the only services he desires, where feeling released always with the consciousness that the bank is doing for him. 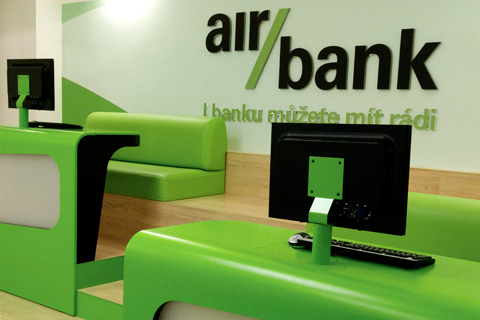 The final result is not a traditional bank but a real store, with the aim to simplify the complex world of banking, using modern technologies, innovative but simple based on a new service model, paperless with outstanding services following Air Bank values of simplicity, transparency, environmental friendly within the courage to offer the world an extraordinary and never seen bank model. All these features visible even in the simple logo, clean and sharp in a mixture of green and black colours giving freshness, vitality and the sense of renaissance and regeneration. The inspiration came from Agora landscape, in ancient Greek an open “place of assembly”, to create an opened bank, where staff and customer can stay side by side, keeping out from the key points of traditional service models. A place where been really involved into the experience of freedom to browse by oneself, confort to take a seat and care to have assistance upon a touch in an opened layout as expressly reiterpreted by the agora concept, to give the store a clear impact and an easy approach. To do this Crea International’s team have conceived an open squared place with just a multifunctional central area to make the space fruition free, without established functions and frills but only functional elements. All surrounded by an amphiteater with a stair seating system looking towards the center, where the customers can choose the seating on different levels according to the activity they have to do, discuss and take decision. Closed and private spaces are reduced in order to avoid any connection to the old world of “bank offices”. Finally a bank speaking a new language, which sets the mark of a really different bank which does not intend to astonish and confuse, but innovate to create value.